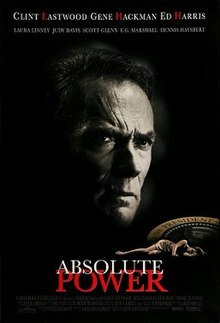 Absolute Power is a 1997 American political thriller film produced by, directed by, and starring Clint Eastwood as a master jewel thief who witnesses the killing of a woman by Secret Service agents. The screenplay by William Goldman is based on the 1996 novel Absolute Power by David Baldacci. Screened at the 1997 Cannes Film Festival, the film also stars Gene Hackman, Ed Harris, Laura Linney, Judy Davis, Scott Glenn and Dennis Haysbert. It was also the last screen appearance of E. G. Marshall. Master thief Luther Whitney (Clint Eastwood) breaks into the mansion of billionaire Walter Sullivan (E. G. Marshall), but is forced to hide upon the arrival of Sullivan’s wife Christy (Melora Hardin), on a drunken rendezvous with Alan Richmond (Gene Hackman), the President of the United States. Hidden behind the bedroom vault’s one-way mirror, Whitney watches in horror as Richmond becomes sexually violent; Christy, in self-defense, stabs him with a letter opener. Richmond screams for help, and Secret Service agents Bill Burton (Scott Glenn) and Tim Collin (Dennis Haysbert) burst in and shoot Christy to death. Chief of Staff Gloria Russell (Judy Davis) arrives, and they stage the scene to look like a burglary gone wrong. Whitney is unnoticed until he makes his getaway, pursued by the agents, but he manages to escape with millions in valuables as well as the incriminating letter opener. Detective Seth Frank (Ed Harris) heads the murder investigation. Though Whitney, known to authorities as a high-profile burglar, becomes a prime suspect, Frank does not believe he is a murderer. Burton asks Frank to keep him informed on the case and wiretaps Frank's office telephone. Just as Whitney is about to flee the country, he sees Richmond on television publicly commiserating with Sullivan - a close friend and financial supporter of the president - on his loss. Incensed, Whitney decides to bring Richmond to justice. He taunts Russell, leaving her a photograph of the letter opener. Whitney's estranged daughter Kate (Laura Linney), a prosecutor, accompanies Frank to Whitney's home in search of clues. She agrees to set her father up, arranging a meeting at an outdoor café where the police can take him into custody. Frank guarantees Whitney's safety, but Burton learns of the plan through the wiretap, and both Collin and McCarty (Richard Jenkins) - a hitman hired by a vengeful Sullivan - prepare to kill Whitney. The two snipers, each unaware of the other, try to shoot Whitney when he meets with Kate. Both miss, and Whitney escapes disguised as a police officer. Whitney later explains to Kate exactly how Christy was killed and by whom. Whitney tricks Russell into wearing Christy's diamond necklace during a White House event. Suspecting that Kate must know the truth, Richmond decides she must be eliminated. When Whitney learns from Frank that the Secret Service has taken over surveillance of Kate, he races back to Washington, D.C. to protect her. Whitney arrives moments after Collin forces Kate’s car off a cliff, but she survives. Collin tries again to kill Kate at the hospital with a poison-filled syringe, but Whitney subdues him with a syringe of his own. Collin pleads for mercy, but Whitney delivers a fatal dose. Whitney replaces Sullivan's chauffeur, and tells Sullivan what truly happened the night his wife was killed. Sullivan is unconvinced until Whitney explains how Richmond lied in his speech about Christy's excuse for staying home that night, which he could only have learned from her. He gives Sullivan the letter opener with Richmond's blood and fingerprints, and tells him that he has since returned the stolen items. Whitney drops Sullivan off outside the White House. Sullivan passes through security with the letter opener and enters the Oval Office. Meanwhile, alerted by Whitney that his phone has been bugged, Frank discovers that a remorseful Burton has committed suicide and uses the evidence Burton left behind to arrest Russell. On television the next morning comes the shocking news from Sullivan that Richmond committed suicide by stabbing himself to death (it is uncertain if Richmond died by his own hand or by Sullivan's). Whitney is satisfied that justice has prevailed, and happy his daughter is safe and part of his life again. At the hospital, Whitney watches over Kate’s recovery. Detective Frank visits briefly, whereupon Whitney suggests to Kate that Frank join them for dinner sometime. The worldwide book and movie rights to the novel were sold for a reported $5 million. William Goldman was hired to write the screenplay in late 1994. He worked on several drafts through 1995, which he later described in his memoir Which Lie Did I Tell?. When Eastwood first heard about turning the book into a film, he liked the characters and the basic plot, but disliked the fact that most of those he considered the interesting characters were killed off. He requested that Goldman make sure that "everyone the audience likes doesn't get killed off." Absolute Power was filmed between June and August 1996. Absolute Power was met with mixed reviews from critics. In her review in The New York Times, Janet Maslin gave it a mixed review, writing, "Mr. Eastwood directs a sensible-looking genre film with smooth expertise, but its plot is quietly berserk." Maslin goes on to write, "Mr. Eastwood's own performance sets a high-water mark for laconic intelligence and makes the star seem youthfully spry by joking so much about his age." On the aggregate reviewer web site Rotten Tomatoes, the film received a 47% positive rating from top film critics based on 43 reviews. The film was not a box office success domestically, grossing $16,770,220 on its opening weekend. The film earned a total domestic box office gross of $50,068,310, barely recouping its $50 million budget. The soundtrack to Absolute Power was released on March 11, 1997. ^ "Clint Eastwood Is Returning to Acting". MovieWeb. 2017-05-21. Retrieved 2017-10-13. ^ "Festival de Cannes: Absolute Power". Festival de Cannes. Retrieved September 27, 2009. ^ Blair, Iain (March 1997). "Clint Eastwood: The Actor-Director Reflects on His Continuing Career and New Film, Absolute Power". Film & Video. 14 (3): 70–78. ^ Maslin, Janet (February 14, 1997). "Absolute Power: A Whole New Meaning for Executive Privilege". The New York Times. Retrieved March 13, 2012. Baldacci, David (1996). Absolute Power. New York: Grand Central Publishing. ISBN 978-0-446-51996-0.